064a – Amadeus | All Eighties Movies. All The Time! 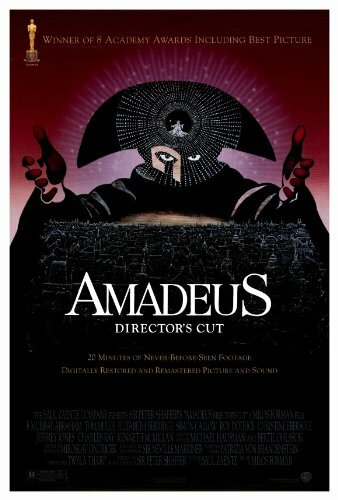 This week Gidgit and Angry start their two part podcast on the incredibly successful Amadeus. Join us for a chat on the amazing costuming and scenery as well as that incredible music by a certified genius. Wolfgang Amadeus Mozart. This entry was posted in Podcasts and tagged drama, music, musical. Bookmark the permalink. This is also my favorite movie of all time Gidgit. Thank you both for podcasting this movie. It is perfect. One of the greatest films ever made. I salute you both for paying respect to this amazing movie. I agree it could be 5 hours long for just the first part but I think you both covered what you needed to. You did get one piece of music wrong Gidgit but forgiven as it is a complex history of Wolfgang Amadeus Mozart. Well done both of you. Long time listener, first comment. You have both out done yourselves. The information, the music. Felt I had to pay credit. I adore this movie. I play violin and piano and Mozart is a hero of mine. Thank you so much for such a wonderful podcast. You both may have got me into classical music. If you have you have achieved something my mother never could have. PS Love your podcast btw.